By Golly, Molly! 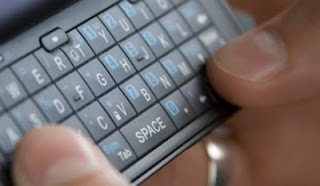 : The New "First Base"
Interesting, the whole texting thing. My husband doesn't think it's going to last. "Too much of a manual task," he says. Besides, texting can be so vague - not enough context and details. What does "5 min" really mean anyway? Arriving early? Still on freeway? You just now moved onto the massage part of your pedicure? But I do love texting. Although it makes me bump into people sometimes. So I'm working on texting safely. Oh, and texting considerately. When I hear that ringtone or buzz go off during coffee with a friend, I'm tempted to put our conversation on hold to see what I got. A rude thing to do? So outwardly I remain attentive: "I'm very sorry to hear about your sore toe." But inside I'm giddy. Did Jeff get a raise? My daughter an A+? Sunset Magazine wants to send me on the road to write pieces for them? The possibilities are endless! Texts are like little presents throughout the day, just waiting to be opened. But let's be honest - I'm not that naive. There are plenty of "bad news" texts out there. Like the "Call me now" texts. What did I do? Who died? It costs HOW much? A little anxiety gets thrown in once in awhile. Keeps things real. "U stop txting 1st. Hahaha." "No, u stop txting 1st. Hahaha, lol!" What then to make of texting? Is this shortened and abbreviated mode of communication bad for us? Should we all go back to writing letters? Talking on the phone? Face to face? Time will tell. But I sometimes wonder what it'd be like if God were a texting God. Although I'm sure he loves my lengthy, overly-worded prayer journal, my to-the-point prayers - or "texts" - get to him just the same. Take a look at Nehemiah in the Old Testament. The king asked him a question, and Nehemiah was dreadfully afraid to answer. After all, the king could do whatever he wanted to him. So Nehemiah quickly and silently "prayed to the God of heaven" before he answered the king. What was that prayer exactly? What did he text to God? "Help me?" Who knows. Whatever it was, it was quick and did the trick, for the king showed him favor. So omitting a few prayer details for the sake of brevity may not be so bad. Not to worry. God's got enough time for the entire universe - both our endless, sob-filled prayers and our "5 min" ones rise up to him. As for all the criticism texting gets, I'm not losing sleep over it yet - anything that slows down the first-to-second-to-third-base dating process is fine by me!